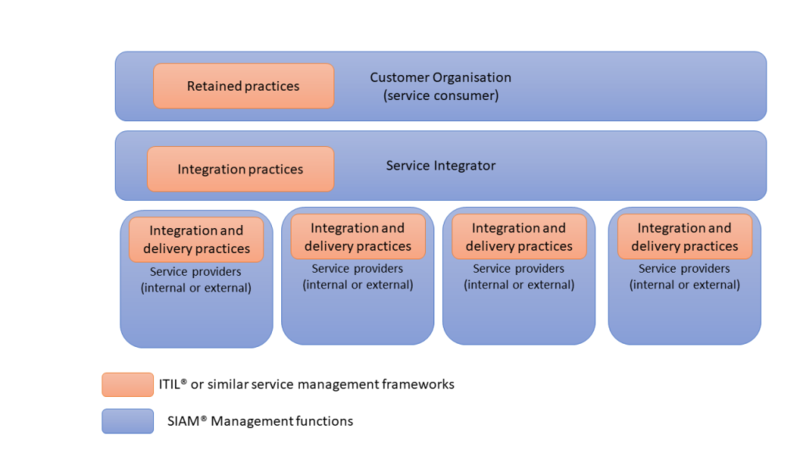 Service Integration and Management (SIAM) is a management model. It is used by businesses that use multi-sourcing of services from several service providers. SIAM provides governance, management, integration, assurance of coordination with an objective to provide maximum value to the business from its service providers. Consider SIAM as an organisational function that is accountable for integrating multiple service providers. The SIAM body of knowledge provides different ways of structuring the integration function that the advantages and limitations of each configuration. SIAM is not a process reference framework like ITIL, COBIT, ISO/IEC 20000. The practices suggested in these reference frameworks can be owned by the customer organisation, service integrator and service provider. SIAM is a relatively new management model. Though the concept is not new the formal Body of Knowledge (BOK) was created only in 2016. Typically it is used for large Government sourcing contracts. The integrators rely on the Service Management tools capabilities to perform service integration and reporting. There is a publicly available Body of Knowledge and an independent training. SIAM does not have any supporting assessment model. The consumer organisation can choose to retain any practice areas according to their business needs. The table shows one approach where the consumer organisation chooses to retain or share most of the general management practices of ITIL 4. The service management practices are outsourced to the SIAM provider (could be external or internal). The technical management practices are assumed to be owned by the Service Provider. There is a significant overlap between the skills covered in ITSM frameworks (ITIL,COBIT) and SIAM. SIAM is also covered by a Body of Knowledge (BOK) and associated Foundation training managed by the certification body APMG International. The SIAM certification is currently aligned with ITIL v3 process areas.